Nuts in cuisine are a much less restrictive category than nuts in botany, the term being applied to many seeds that are not true nuts in the botanical sense. 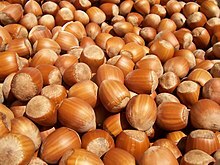 Any large, oily kernel found within a shell and used in food may be regarded as a nut. Because nuts generally have a high oil content, they are a highly prized food and energy source. A large number of seeds are edible by humans and used in cooking, eaten raw, sprouted, or roasted as a snack food, or pressed for oil that is used in cookery and cosmetics. Nuts are a significant source of nutrition for wildlife. This is particularly true in temperate climates where animals such as squirrels and jays store acorns and other nuts during the autumn to keep them from starving during the winter and early spring. This page was last edited on 15 February 2015, at 17:10.